The Connecticut woman who underwent a face transplant five years ago after being attacked by a chimpanzee is back in a Boston hospital after doctors discovered her body is rejecting tissue from the transplant. Dr. Bohdan Pomahac, director of plastic surgery transplantation at Brigham and Women's Hospital, said Wednesday that Charla Nash is experiencing a "moderate rejection episode" and the transplant is not in jeopardy. Nash was taking part in an experiment in which doctors had tried to wean her off the anti-rejection drugs she had been taking since the 2011 operation. Anti-rejection drugs can have serious side effects, and the military had funded the experiment in hopes of using the findings to help soldiers who had transplants after returning from war. Pomahac said doctors have removed Nash from the experiment and put her back on her original medication. He said she will most likely leave the hospital in the next day or two. "We expect this rejection episode to be resolved within the coming week," he said in a statement. Nash, 62, recently discovered several unusual patches on her face, said Shelly Sindland, her publicist. Doctors on Monday did a biopsy and determined her body was rejecting the transplant, she said. "I gave it my all and know my participation in the study will still be beneficial," Nash said in a statement to The Associated Press. "I'd do it all over again, if I could. The men and women serving our country are the true heroes." The immunosuppression drugs that transplant patients are typically given for the rest of their lives carry such risks as cancer, viral infections and kidney damage. Because of those dangers, many transplants of non-vital body parts, such as thumbs, are not considered worth doing. But doctors say that could change if the drugs don't have to be a lifelong commitment. The Pentagon, which also paid for Nash's transplant, has provided grants to 14 medical facilities across the U.S. through its hand and face transplantation program. The face and the extremities are the most frequently injured parts of the body in war. "I'm just happy I had the chance to help," said Nash, adding that she feels fine. "I wish I could have done more. I believe in the power of prayer and appreciate everyone who is praying for me." Nash lost her nose, lips, eyelids and hands when she was mauled in 2009 by her employer's 200-pound pet chimpanzee in Stamford, Connecticut. Doctors also had to remove her eyes because of a disease transmitted by the chimp. She later received new facial features taken from a dead woman. 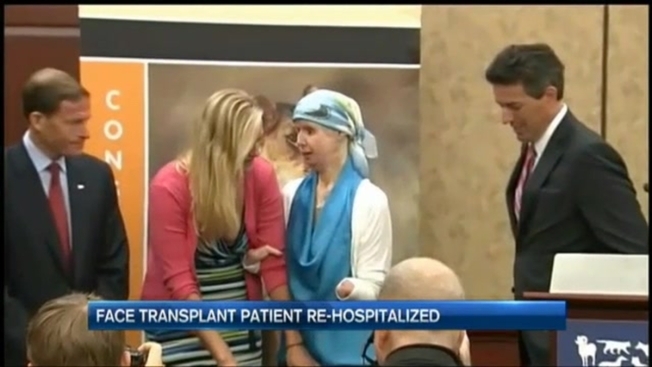 She also underwent a double hand transplant, but it failed when her body rejected the tissue. When she began the experiment involving the suspension of anti-rejection drugs in March, 2015, doctors said it would eventually include other patients and its findings could potentially affect hundreds of thousands of people, military and civilian alike.